These large round knobs have a heft and substance typical of Craftsman style hardware. 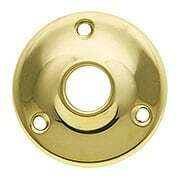 Cast from solid brass, they're both durable and attractive. A lacquered, oil-rubbed bronze finish completes the classic Craftsman look. 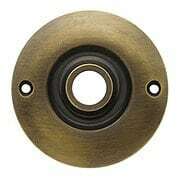 These standard round door knobs are an economical replacement for missing or damaged knobs. 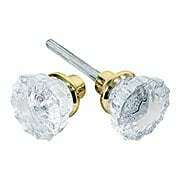 Hollow, yet sturdy, they are made of solid wrought brass with your choice of four classic finishes. Plain round knobs are as versatile as they are timeless. 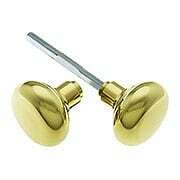 Forged from top quality solid brass, these knobs will last a lifetime. seven finishes give you options for every room in the house. 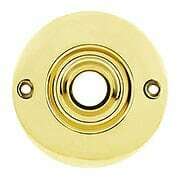 These standard round door knobs are an economical replacement for missing or damaged knobs. 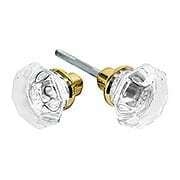 Hollow, yet sturdy, they are made of solid wrought brass with your choice of a polished lacquered finish or chrome plated. 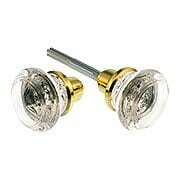 These simple and shapely oval knobs are as pleasing to the hand as to the eye. Based on a timeless turn-of-the-century design, they're at home in colonial, craftsman or even contemporary style interiors. 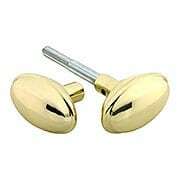 Forged from durable solid brass. Pacific Hardware of Los Angeles designed this distinctive Pacific Pattern Back Plate without Keyhole around 1912 as part of their Bastille Series. The rugged, hand-hammered pattern, originally created in solid copper, is reproduced in durable and affordable cast brass. A velvety bronze finish completes the authentic look. Pacific Hardware of Los Angeles designed this distinctive Pacific Pattern Back Plate with Keyhole around 1912 as part of their Bastille Series. The rugged, hand-hammered pattern, originally created in solid copper, is reproduced in durable and affordable cast brass. A velvety bronze finish completes the authentic look. Our New York style back plates are made the old-fashioned way, from heavy-duty stamped sheet brass. 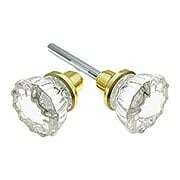 Pair them with glass knobs to give your doors a classic early 20th century look. 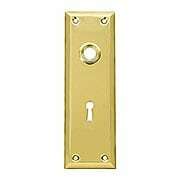 The keyhole version works with most new or vintage mortise locks. Our New York style back plates are made the old-fashioned way, from heavy-duty stamped sheet brass. Our living antique finish completes the vintage look. 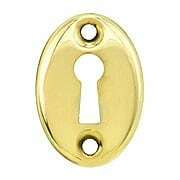 The keyhole version works with most new or vintage mortise locks. 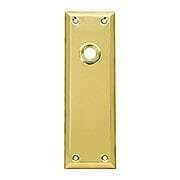 This New York style back plate is designed for the interior side of a bedroom or bathroom door. 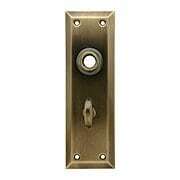 It features a classic crescent thumb to activate the privacy mortise lock from inside the room. Made of solid, wrought brass in 4 finishes. 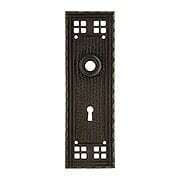 This New York style back plate is designed for the interior side of a bedroom or bathroom door. 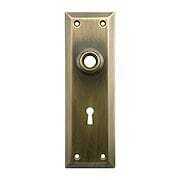 It features a classic crescent thumb to activate the privacy mortise lock from inside the room. Made of solid, wrought brass in our living antique finish. Our tailored New York back plate has a timeless appeal. Whether your style is Victorian, Craftsman, or Mid-Century modern, this spare, beveled design will fit right in. Made of heavy duty forged brass with 7 classic finishes! 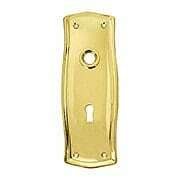 These brass-plated New York back plates are an economical way to give your doors pure vintage style. 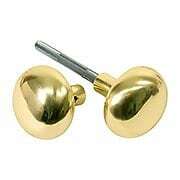 Made of stamped steel, with a polished and lacquered brass plating. 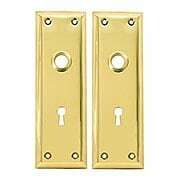 At 2 1/4" wide, they work on pre-drilled doors, as well as with most antique mortise locks. 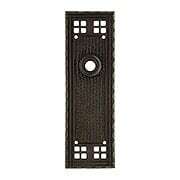 This stamped brass door plate is an economical way to give your door a vintage look. 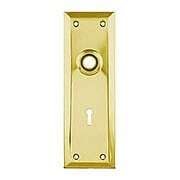 At 2 1/4" wide, it works on pre-drilled doors as well as with most mortise locks. Choose from polished lacquered brass or polished chrome finishes. 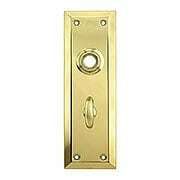 This stamped brass door plate is an economical way to give your door a vintage look. At 2 1/4" wide, it works on pre-drilled doors or as part of a dummy set. 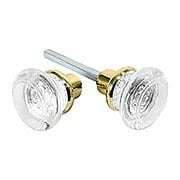 Choose from polished lacquered brass or polished chrome finishes. The simple and homey look of our Prairie back plate makes it a popular choice for Craftsman, Colonial or farmhouse style homes. 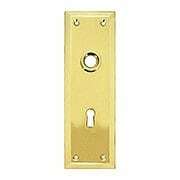 This heavy duty keyhole plate is forged from solid brass, and works on pre-drilled doors! Matching oval knobs available! 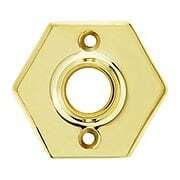 This brass hexagonal rosette is a wonderful alternative to the round standards. Reproduced from an early 20th century original, it's made of solid, forged brass with a choice of finish. Not for use on pre-bored doors. 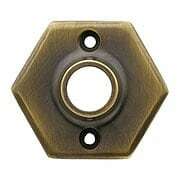 This brass hexagonal rosette is a wonderful alternative to the round standards. Reproduced from an early 20th century original, it's made of solid, forged brass. Finished with our exclusive living patina. This classic stamped brass rosette is exactly like those found in American homes of the 1910s and 20s. The shapely profile, 3 screw holes & matching slotted screws make it a great choice for exacting restorations or new vintage style construction. Door sets with simple, stamped brass rosettes were a popular and affordable choice for home owners in the early 20th century. At 2 1/4" in diameter, these rosettes are just right for restorations or for vintage style new construction. Solid brass. 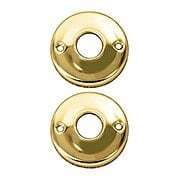 These 2" rosettes are just right for restorations or vintage style new construction. Made from stamped sheet brass, they're both affordable and authentic. Choose from polished lacquered brass or polished chrome finishes. When you have a pre-bored door, but want to use vintage style knobs, this 3 1/4" diameter rosette may be just the thing. 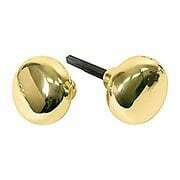 Made of solid, forged brass with a choice of finish. When you have a pre-bored door, but want to use vintage style knobs, this 3 1/4" diameter rosette may be just the thing. Finished with our exclusive living patina.